How Ordinary Chinese Are Talking And Fighting Back Weibo, China's equivalent of Twitter, is changing the way the Chinese communicate and has become a major source of news. Its more than 300 million users are, among other things, using it to criticize government policies, stop official injustice and help ordinary people — but only up to a point. Never have so many Chinese people spoken so freely than on Weibo, China's answer to Twitter. Just 4 years old, the series of microblog services now has more than 400 million users. And, increasingly, Chinese are using it to expose corruption, criticize officials and try to make their country a better place — even as China's Communist Party tries to control the Weibo revolution. Were it not for Weibo, you would never know Tang Hui's extraordinary story. She wouldn't be free to tell it; she'd be sitting in a Chinese re-education-through-labor camp eating porridge. Instead, Tang is at home in Hunan province, sharing her Kafka-esque tale. Weibo had a very big impact on my situation because our local government tried to cover up this case. ... But this time, people around China and even around the world found out they put me in labor camp. And the local government couldn't resist so many people's power. It began in 2006, when a pimp lured her then-11-year-old daughter into a brothel in the central Chinese city of Yongzhou. "He said, 'If you cry, I am going to go kill your mom. I know where your mother's business is, and I know your mother,' " Tang recalls. The fifth-grader was forced to service scores of clients. After three months, Tang got a tip about her daughter's location and called the cops. But Tang says the first officer to arrive at the brothel never got out of his car. And even after she convinced police to rescue her daughter, they wouldn't arrest anyone. "We demanded they take notes when interviewing my child. They repeatedly refused. They said this was not a criminal case," she says. Later, Tang found out why the police were so reluctant: The brothel owner had an uncle who was a top official in the local prosecutor's office. A court did eventually convict the brothel staff. But over the years, Tang continued to demand public punishment for the police who tried to shield them. In August of this year, the police had had enough and called Tang. When she arrived at the station, there were seven or eight "special forces" police to guard her. "They asked me to sit in a chair for interrogation. I spent a night in the chair and didn't sleep at all," she says. At 7:30 the next morning, they gave her a document, notifying her that she would be sent to re-education-through-labor camp. For 18 months. No lawyer. No trial. A man holds an iPhone as he visits Sina's Weibo microblogging site in Shanghai earlier this year. Before the cops hauled her off, Tang called her attorney, who posted the news to his Weibo account. Within days, Tang's story had reached more than 30 million Weibo users — and they were furious. A torrent of criticism followed, overwhelming the local police. After 10 days, the state-run China Central Television announced Tang's release. Just a few years ago, Tang says, this couldn't have happened. "Weibo had a very big impact on my situation because our local government tried to cover up this case and not let the public know," she says. "But this time, people around China and even around the world found out they put me in labor camp. And the local government couldn't resist so many people's power." 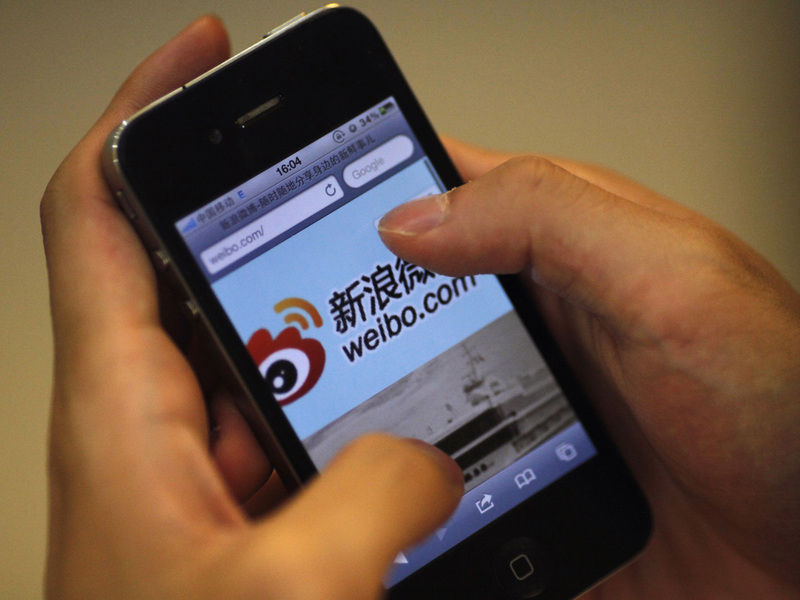 Weibo is changing the way Chinese communicate and has become a major source of news in China. "Any local news can immediately become national news," says Hu Yong, a professor at Peking University's School of Journalism and Communication. Adds Isaac Mao, one of China's first bloggers: "Weibo is the battleground between the authority and freedom-thinking people." Hu says Weibo has also become a powerful new tool for ordinary people to protect their rights. "Before the emergence of Weibo, local people actually had limited channels to try to solve their problems. Weibo is kind of pressure politics on local government officials," he says. In recent months, Weibo campaigns have triggered a number of firings. They include officials in western China who forced a woman to abort her seven-month old fetus, and a safety chief who was photographed wearing various luxury watches and smiling at the scene of a fatal bus accident. Observers call it "Weibo Justice." Why does China's famously thin-skinned regime put up with such criticism? Michael Anti, a prominent Chinese political commentator, says that when the criticism is directed at local officials, those attacks actually serve the central government. "Chinese have a longtime myth that the emperor is good, all the thugs are local. So that myth is important to keep the regime's legitimacy," Anti says. "I think Weibo justice is a showcase for the government to tell the people [that] the emperor ... is still good." On occasion, the party will even allow Netizens — or Wangmin, as they are known in Chinese — to attack high-ranking officials it wants to get rid of. That's what happened to then-Chongqing Communist Party boss Bo Xilai, who was lobbying for a top post in Beijing before his spectacular downfall this year and had many enemies. After Bo's police chief hid out in a U.S. Consulate earlier this year, Anti says it was open season on Weibo. "You can joke about Bo Xilai and Chongqing city, about everything. Weibo became a very convenient platform," Anti says. This isn't to say there isn't censorship when it comes to sensitive political or human rights topics — there is, and plenty of it. And the party won't tolerate anything it remotely sees as a threat. Authorities detained a Beijing blogger earlier this month after he jokingly imagined the recent party leadership congress as a horror movie in which the delegates die en masse. But, like most Americans, most Chinese don't use Weibo for politics. They use it to pursue their interests and, sometimes, to help strangers who share them. Take the case of Richard Sears, a retired computer programmer from Tennessee. For the past 22 years, he has been working on a website on the etymology of Chinese characters. Sears came to China this year to do research for his website, a personal hobby. But he says because of bad information, his tourist visa was canceled in August. "[The authorities] confiscated my passport. I found myself with 10 days to get out of the country. At that point, I figured I would have to go home and never come back to China," he says. Sears had one thing going for him: his Weibo connections. "I had a few friends on Weibo — I didn't realize how many friends I had on Weibo — but I told a couple of my friends about it and then suddenly, within a couple of days, there were 40,000 retweets." Job possibilities poured in from Chinese supporters trying to help Sears stay in the country. Last week, Sears arrived back in Beijing with a work visa and a job teaching physics and doing Chinese language research at Beijing Normal University. "Without Weibo, this would have been impossible," Sears says. Weibo is still in its infancy. China's government and the microblog companies themselves employ an army of censors every day to manage and shape its growth. Sears isn't sure how Weibo will ultimately evolve. But he thinks the potential is huge.